The animal is a rare survivor of injuries by poachers who hacked off her horns. 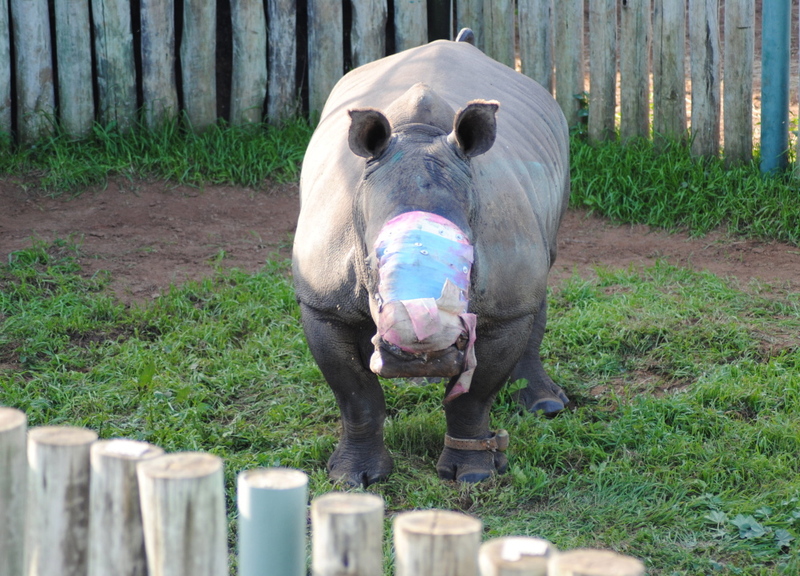 JOHANNESBURG – The rhino’s rescuers gave her a name: Hope. Poachers in South Africa had darted the rhino with a tranquilizer and hacked off her horns while she was sedated, leaving the animal with a horrific wound covering much of her face. A couple of days later, staff on a wildlife reserve found the grievously injured rhino – alive. Last week, veterinarians operated on the 4-year-old female, a rare survivor of increasing attacks by poachers who killed more than 1,200 rhinos last year in South Africa, home to most of the world’s rhinos. They removed maggots and dead tissue, applied dressing and fastened a fiberglass cast with steel screws. The wound measures about 191/2 by 11 inches, the biggest of 10 similar cases that the team has treated in the last three years. “If we can save Hope and she can go back and produce more offspring, then in her lifetime she would have contributed to the survival of the species,” said Dr. Gerhard Steenkamp, a veterinarian from the University of Pretoria. He is a member of Saving the Survivors, a South African group that treats rhinos with gunshot wounds, facial gouges and other injuries inflicted by poachers. Demand for rhino horn is high in parts of Asia where it is seen as a status symbol and a cure for illness despite a lack of evidence that it can heal. The rhino called Hope was attacked in Lombardini, a wildlife reserve in Eastern Cape province where several rhinos were poached recently. Hope’s nasal bone was badly fractured and part was removed, exposing the sinus cavities and nasal passage. Surgery occurred May 18 after the rhino was transferred to another reserve. It could take at least a year for Hope’s wound to heal after multiple treatments, Steenkamp said. It cost $75,000 to treat Lion’s Den, a rhino with a similar but less severe injury, and Thandi, a rhino whose horns were hacked off in 2012, recovered and gave birth in January, according to Saving the Survivors.